Aspen, CO – An odd sounding whirrrrr goes past, and I snap my head around to look. I had just repositioned myself on the race course and was still fiddling with my camera, when out of the corner of my eye I see an athlete whip past me on his way down the course. I think to myself that these guys are really flying and taking risks, but then again, what did I expect? These are some of the fastest skiers you’ll ever meet. And most of them here at the World Cup Finals in Aspen will soon head to the Olympics. More specifically, they’ll head to the 2010 Paralympic Games in Vancouver, which start March 13th. These races in Aspen all this week are the International Paralympic Committee 2010 World Cup Finals hosted by Challenge Aspen at Buttermilk ski area. Competitors from all over the globe are here for training and racing in Downhill, Super G and Super Combined. Laurie Stephens waits in the starting gate for her DH training run at the IPC 2010 World Cup Finals at Buttermilk ski area. Heath Calhoun during a training run at the IPC 2010 World Cup Finals in Aspen. This was only a training day, but the speeds were very high on the Downhill track. I’ve attended and coached enough ski races to estimate that 60-plus m.p.h. speeds were in the offing – at least. That whirring sound, foreign to me, was actually the wind going through the supports on a sit-ski as it shot over the Waterfall section of the course. I am seriously impressed with what these athletes are doing on the hill. Challenge Aspen has developed its own group of gifted athletes and coaching talent since it expanded its mission into competition programs a number of years ago. Kevin Jardine, the Director of Competition Programs, has collected the 2008 Paralympic Leadership Award and the 2006 USSA International Disabled Coach of the Year, the sport’s highest honor. The Challenge Aspen team itself has five athletes headed to Vancouver: sit-skiers Laurie Stephens, Joe Tompkins, and Heath Calhoun, and visually impaired skiers Caitlin Sarubbi and Mark Bathum. Paralympic-based alpine skiing athletes fall into three general categories: visually impaired, sit-skiers and standing skiers. Within each of the three main categories there are numerous sub-categories which are all given the equivalent of a golf handicap rating. In the visually impaired category, the competitors are doing something that no sane sighted racer would even attempt: following a guide down the hill at close range and very high speeds, using two way headsets to help communicate. For starters, think of the challenge of snow spraying up in the air during a turn from the guide. While only one skier is timed, both skiers have to be great athletes with impeccable timing and trust. Would you dare to look backwards at over 60 miles an hour in a downhill race? These guides do. Visually Impaired skier Mark Bathum follows guide Slater Storey on a training run at the IPC 2010 World Cup Finals in Aspen. 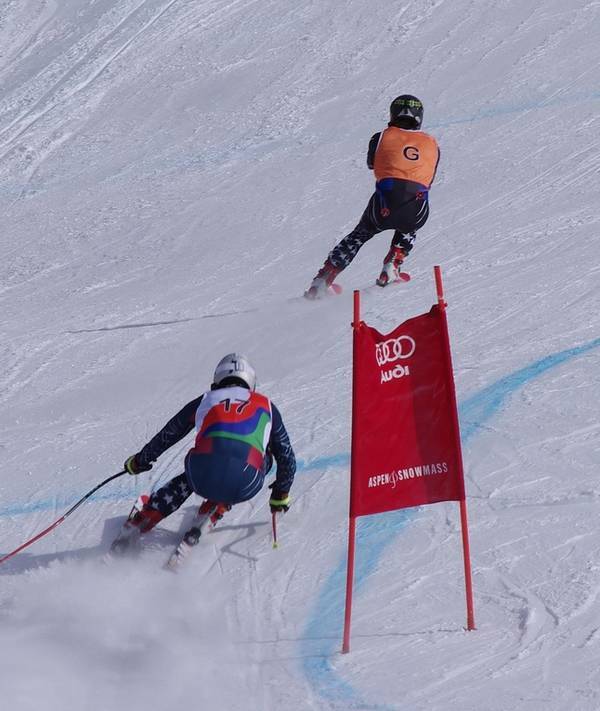 Both of Challenge Aspen’s visually impaired skiers have partial vision. Those competing fully blind are required to wear blacked out goggles. But trying to find a gate on the hill at speed, with little or no peripheral vision, is not an option. Think of looking though a straw. The racers can at least focus on the guide, if not the snow, ruts or gates. In the sit-ski category, Heath Calhoun’s path to ski racing includes losing both legs above the knee in Iraq. 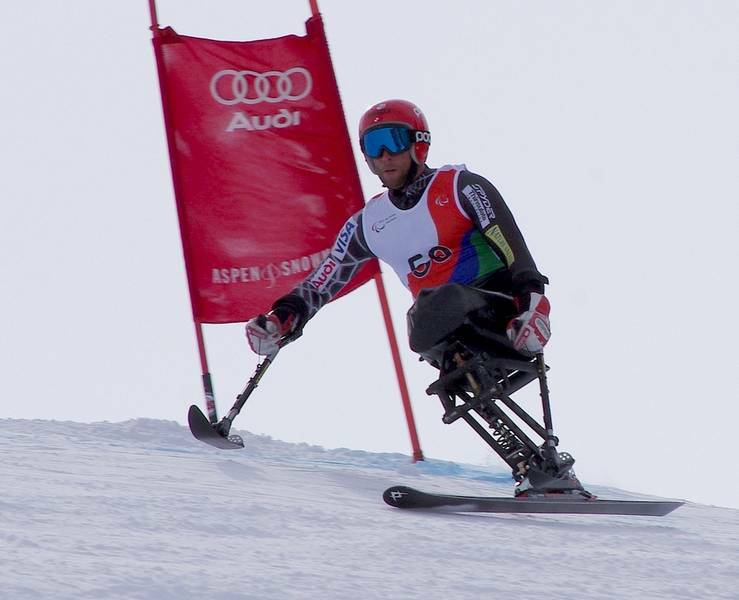 He will be the first injured U.S. veteran from the current conflicts in the Middle East to compete in the Winter Paralympics. Jardine describes Calhoun as one of the most committed athletes he has worked with. Listening to Calhoun pick back through his training run, trying to isolate any section of the course on which he could find more speed or attempt a different tactic, it’s clear how he’s risen into the top 10 in such short order, earning the 2009 national Super G crown after receiving a competitive start in just 2007. Calhoun is the first of what may eventually be many Wounded Warriors to take to the sport. Laurie Stephens’ trip to Vancouver follows a highly successful Games in Torino in 2006, with two Golds and a Silver to her credit. 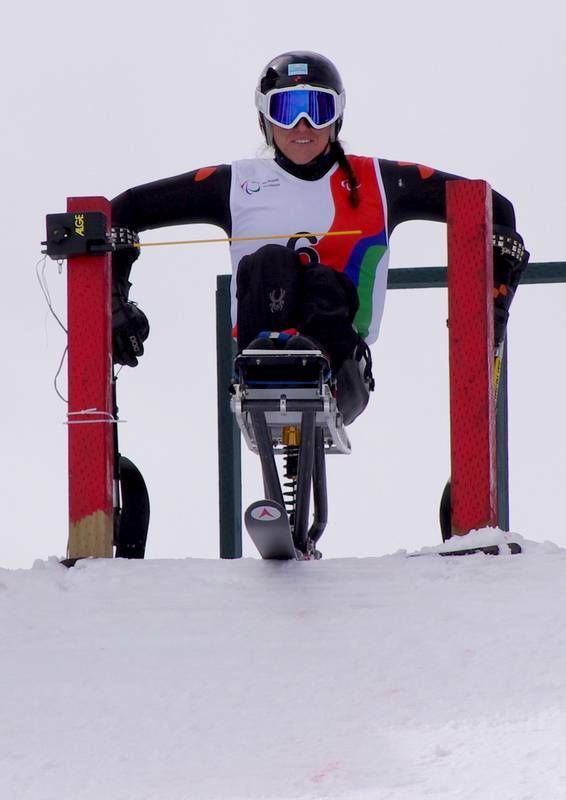 She came to adaptive ski racing through spina bifida. Talking to her after her training run, she described her slow adaptation to speed while never being fully comfortable with it — which sounds exactly like the thin line that has challenged able-bodied ski racers in speed events throughout history. Speed events are nonetheless still Stephens’ favorite, and at this point in her career she is spending more time letting the spotlight focus on others during the World Cup season while maintaining her own focus on the Paralympics. Most often, racers in the standing category have only one leg. For just a moment, visualize yourself making an endless two-minute turn with no relief for your leg muscles. To do so over and over each day to learn, train and compete… well, it’s inspiring. These athletes follow the snow around the globe just like their able-bodied U.S. Ski Team counterparts, training at Oregon’s Mount Hood, on European glaciers, or even in Chile. Their season lasts for many months and many of them live in Aspen for the duration of the winter before re-joining families or meeting other commitments elsewhere. So for this week, at least, they get to enjoy competing at such a high level event in their own back yard. Each of them has a unique background that has led them to ski racing, but once on the hill it’s clear that these athletes don’t allow their paths to define them. For each of them the camaraderie, the competition and the joy of the sport brings them together. You may not have heard their names before, but they ski faster than just about anyone and perhaps should be the next athletes on the Wheaties box. These are highly accomplished people. These aren’t adaptive skiers, they’re fully risk-taking ski racers. Author Kevin Gawenus is a First Tracks!! Online Media correspondent based near Denver, Colo.